The Flag of India has an amazing story! The Flag of India has represented its nation proudly. The development and the modification of the India flag coincides directly with modern India history, but the India Flag also has an exciting history behind it. It tells the story of a nations hard work to gain equality, independence and unity for its people. The India flag sports three different colored horizontal rectangles, one on top of the other, and a very important symbol called the Ashoka Chakra is displayed directly in its center. The Ashoka Chakra is a wheel with twenty-four spokes, which are represented in blue. This wheel is important because it represents Dharma; the eternal law for positive living through cyclic reincarnation, Dharma is the primary concept behind the religions of Hinduism, Buddhism and Jainsim. 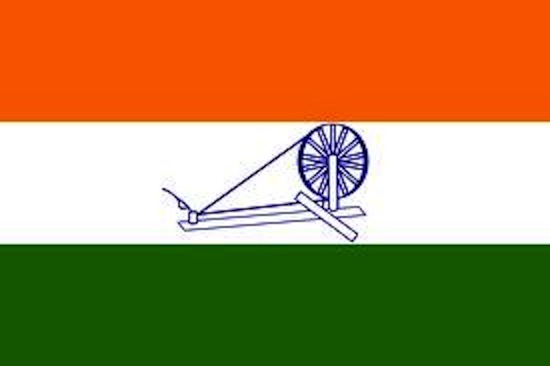 This is the official Flag of India, it was adopted in 1947 by the Republic of India. From bottom to top, the tricolors of the flag of India are green, white and saffron, a golden-yellow color. Saffron is also a rare spice used in Indian cooking. The India flag went through several designs, each created by different designers. One of the designers was Gandhi himself! Each color on the flag has a meaning. The saffron, which was originally red. represents the sacrifices of the people, the white stands for the purity of the people, and the green for hope. The National Flag adopted its present form by India's Constituent Assembly on July 22, 1947. 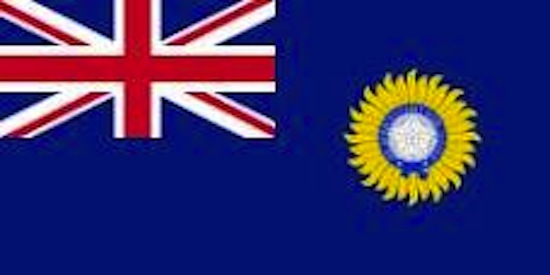 On this day, it became the official flag for the Dominion of India, and it was later approved to represent the Republic of India as well. Next is the story of how it arrived at its final design. While India was under British Rule in the Nineteenth Century, several different flags were used to represent India, prior to its independence movement. There was a rebellion known as the Rebellion of 1857, in which the Indian people united and attempted to overthrow British Rule, but were unsuccessful. So, the British decided that there should be only one singular India Flag to represent India as a British Nation. The first National Flag of India was blue and included the Union Flag in the left upper corner, and the Star of India with the British Crown over it, in its lower right section. This was India's first flag. Obviously, the people of India had very little say in the flag's design! In the early Twentieth Century, the idea came about that there was a need to create an India Flag that better represented the native people. There was talk of putting the elephant-headed Hindu God Ganesh on the flag, talk of a sacred cow on the flag, and several other ideas came about.In 1905, Bengal, a land in the far east section of India, was separated from the nation. With its separation came a new flag called the Bande Mataram. It displayed eight white lotuses in an upper red band, a sun and a crescent in a lower green band, and a Hindi slogan on the central yellow band.This India flag was raised one time at an annual Indian National Congress, but never became popular enough to last; it quickly faded out of use. 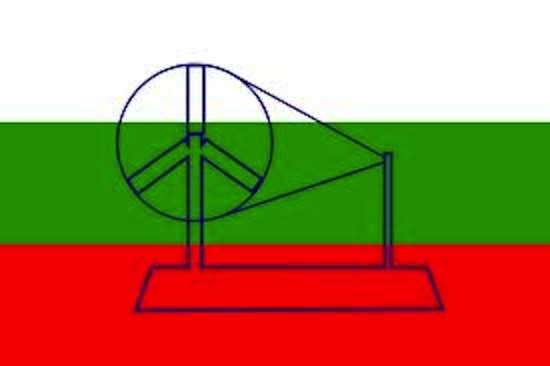 Many flags were proposed, but none stuck until, one day in 1921, Ghandi suggested one.Ghandi endorsed the idea of a red, and green flag with a spinning wheel in the center. The red color would represent Hindus and the green would represent Muslims. Just before its official release, a white banner section was also added to represent the other religions of India. However, the Muslim population almost immediately demanded that they have the color black on the flag to represent Islam. Ghandi saw that this could be a continuing problem and decided to change the meaning of the colors in the flag. The red now stood for the sacrifices of the people, the white for the purity of the people, and the green for hope. 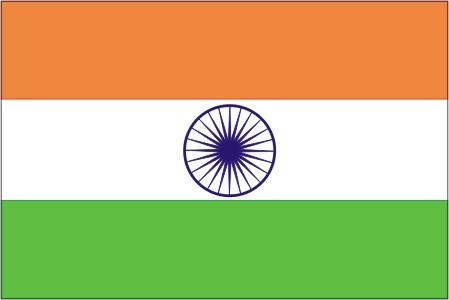 This was India's flag that was endorsed by Ghandi. A version similar to Gandhi's Flag called the Swaraj Flag was introduced in 1923. There was uproar over the new flag because Indian people did not feel that they were all represented. The flag eventually developed into a symbol for India's desire to fight for independence from Britain. Ironically, at about that same time, congress made this new flag the official Flag of India in 1931. This was India's Swaraj Flag from 1923 to 1947, It helped lead to India's fight for independence from Britain. India did in fact gain its independence from the British in 1947. Just a few days before India officially gained its freedom, a Constituent Assembly was formed. The assembly decided it was a good idea to try and represent all of people of India with the Indian flag, and also to make its appearance more symmetrical.This is why today's India Flag displays the Dharmic Chokra and remains the Flag of India today. Leave the flag of India to explore the history of India. Discover fun facts about India. Visit our homepage to explore more of India. Discover how to build your own website about your favorite topic!